Our Soda Jerk cap was traditionally worn by the soda jerk, the counter worker in an old fashioned soda fountain. This hat is great fun when making your favorite soda fountain treats. It is made of paper and fully adjustable to fit most heads. The red striped hat is the same as our traditional white hat but the thin red stripe gives it some extra flare. Looks great with our waist apron or bib apron. Also, its fun for kids to decorate any way they like. Great product at the perfect price. I'm running a classroom ice cream business with my 5th/6th graders and they're thrilled to have their own hats. Sizing is adjustable and they can add colors with markers to make their own individualized design. Very pleased with the product. Timely shipping , great service. The true test will be the Holiday Ice Cream Social for the Kids and Grand -kids. Have a feeling they will be "tickled"!!! Authentic Soda Jerk hats and perfect for old fashion ice cream social. Easy to customize with own logo label. Great customer service,delivery was quick. I bought these for my Dad's 88th birthday bash. His first job was a soda jerk. Everyone was adorable wearing these and singing happy birthday to him. The hats really appealed to all the generations there from 1 to 90+. The hats were crisp and bright. Ordered these for an ice cream event at the job. One size fits all which was great, different people serving ice cream. Nice to see GM and President playing soda jerkers! I bought these hats for my Daisy Girl Scout Troop because we were having an end of the year ice cream social. I thought this would be a cute idea and they were our craft for them to decorate with their name and I had ice cream stickers to put on them. I loved them! Bought these for a 50's theme party. Quality was better than expected. Will continue to use in our ice cream shop. The hats were great for the theme. It is also nice that they are sizable to fit different people. But having to put the paper tissue inside was difficult and we never figured out how to do it. So we used the hats more like a "crown". You couldn't tell unless you could see the top of the head when bending over or squatting. the hats were of very good quality for the price, very authentic looking, perfect for our 50's Sockhop! My husband acted as auctioneer during the Easter Dessert Auction at our local Moose Lodge recently. He wore the soda jerk hat and red bow tie, which added a lot to the excitement! In fact, the hat and tie got auctioned off for $120 at the end of the evening! Perfect!! Was exactly what I was looking for..
We used these for a church Valentine dessert. Our teens wore these when they were serving the ice cream and drinks. Great quality and price. We were very happy with these hats. These hats are so cute. Fits my e year old grandson perfectly with no adjustment. I can't wait to see the class pix. The theme is back to the fifty's. Great hats, easy to adjust. They don't feel like they're going to fall apart even after adjusting them several times for all my kids to get a chance to try it on. Great price for such a high quality item. These hats are perfect, exactly what I needed: adjustable, cute, etc.. 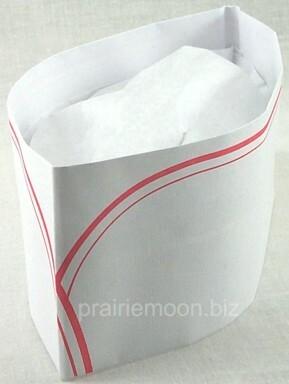 Yes I received my Items "Soda Jerk" paper hats. Let me tell you they were a winner. Man people kept asking me where I found them. I simply said from " Paper Moon" . On the 1st hot day of this year Thursday May 26th we had a carnival theme cook out on the parking lot. My committee was in charge of the Ice cream booth. The hats gave it that nostalgic look. Thanks !! We used these for our ice cream social at my college, they were a hit. We teamed them with a red striped apron, and the hat just completed the "costume" They were surprisingly flattering, and they adjust to fit different size heads. These paper soda jerk hats were a hit with the young men who wore them to serve our guests for our Blast to the Past activity. And the price is the best that I have found anywhere!